As I left yesterday’s interfaith gathering at Northaven, I was filled with joy, peace, and hope. Everything about it exceeded our expectations. There were double the number of folks that we assumed would come (around 420). There were wonderful surprises that even I didn’t know would happen (“This Land Is Your Land,” played on Middle Easter instruments…). And there was an incredible turnout from not only the Muslim community, but also people from all other faith traditions. I was honored that so many of my United Methodist clergy colleagues, and our Bishop Mike McKee, also came. I lost count –it was dozens– of how many Muslim men and women shook my hand vigorously, and told me with great emotion, just how important the day was for them. You could tell that they had been genuinely afraid after last week, and I was reminded of the fears they no doubt live with all the time….fears I never personally have to worry about in my daily life. 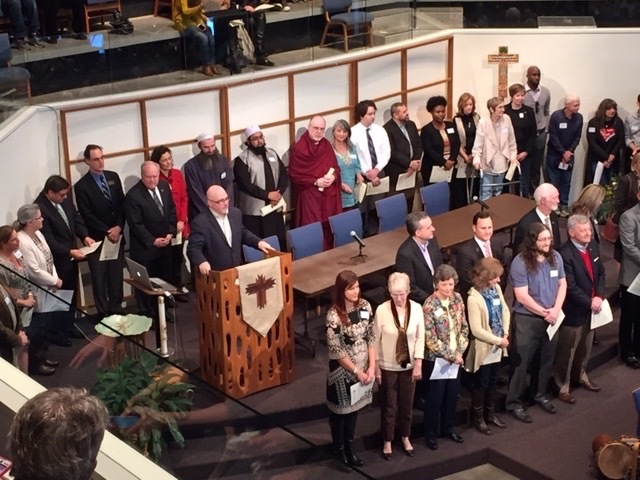 The Interfaith Unity Statement that we created for the day can be found here. In a day or so, we should be able to attach the names of all those clergy who have signed on to it. We know and trust that even more will. A lot of people were shocked at just how quickly this event came together. It was not a confirmed event, and no shred of publicity went out about it, until late Thursday afternoon. How in God’s name, people asked, did you pull this together so quickly?!! First, it clearly filled a need, as. Muslims felt the need to be reassured by their interfaith neighbors. And those neighbors, especially many of us who are Christian, felt the need to stand with them. That felt need to gather together is powerful at times like this. So, it happened because it filled a need. It also happened because the great people of Northaven are always so quick to respond to ministry needs like this. I was so grateful to see how many of them jumped in to usher, greet, and facilitate the entire event on incredibly short notice. But even more than these reasons, as I prepared to leave the building last night I was reminded that friendships matter. The final truth is that we could never have pulled this event together in a couple of days without friendships already in place. Most specifically, through our on-going 2nd Community events, during the past years we at Northaven have had the great good fortune to become friends with many faith leaders around Dallas. A Hindu member of the 2nd Community leadership told me last year, “Northaven is my church.” She’s not gonna stop being Hindu anytime soon. But that deeply moved me to hear her say that about us. The honest truth is that you can’t buy that kind of trust and friendship. You can’t create it in a couple of days. It can only be built, time after time, event after event, encounter after encounter. It’s hard work. But it’s deeply important work. And I can’t emphasize enough how important connecting across racial, religious and economic lines is important to the future of our society. We who call ourselves the church, all of us (that includes us at Northaven) need to continue to do it more and more. And I believe that. All those meetings and pre-meetings. All those events when we wished more folks would have come, or wondered whether it was worth doing. All that hard work matters. It reminds that more than any other reason for yesterday, it’s friendship that matters. WFFA Channel 8 Coverage here. Dallas Morning News Coverage here. 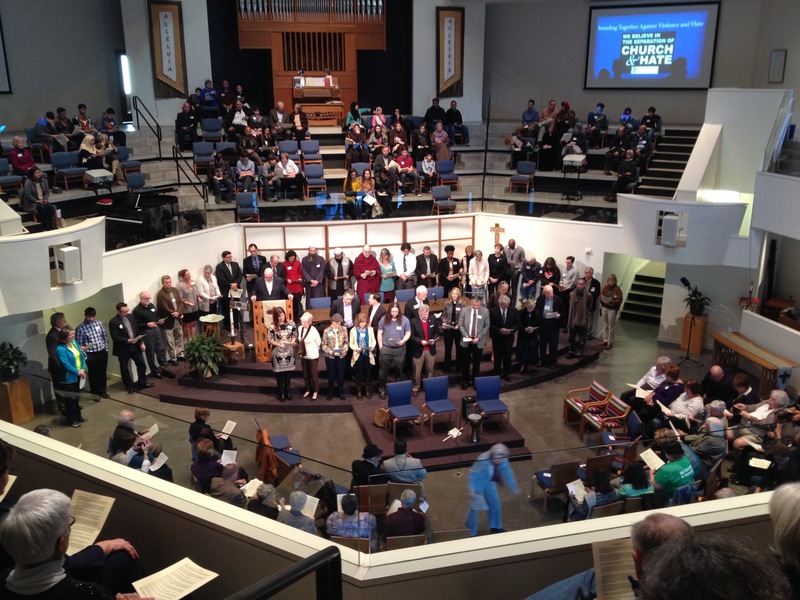 Eric, I’d like to use the larger pic of the faith leaders with my report for United Methodist Insight. Do you know who took the photo? Thanks! Very profound and beautiful. As an Oklahoma Muslim, I am deeply appreciative of both, your kindness, your article and Northhaven United Methodist Churchs’ generosity of spirit and love. I wish you all many blessings and every success, amen.